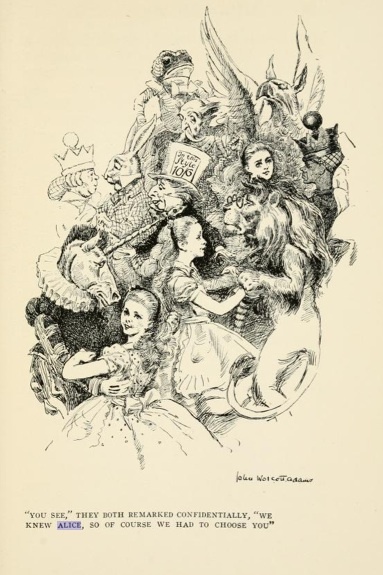 Alice in Beeland by Lillian Elizabeth Roy. Published by Cupples & Leon, 1919. Four black and white full page illustrations, with plenty of smaller drawings of Alice and her bee friends scattered throughout text. Little Alice Wells is exploring her garden when she spies Bombus, a bumblebee, and follows him to overhear him conversing with Madam Zumm and a young bee named Buzz. They give her a special nectar which enables her to enter the Bee world, where she learns much about Bees and their life and society. Malice in Blunderland by Allan Fotheringham. Cover illustration by Roy Peterson. Published by Seal Books – McClelland and Stewart-Bantam Limited, Toronto, 1983. “224 pages of political commentary, anarchist wit and some of the most intelligent assessments of this country” – Toronto Star. Not much Alice connection past the title and cover. Girls in Bookland by Hildegarde Hawthorne (1871–1952). She was a U.S. poet and author, and was the grandaughter of Nathaniel Hawthorne. Illustrated by John Wolcott Adams: an American draftsman and illustrator, 1874-1925. Published by George H. Doran, 1917. Hardback first edition, no dustjacket. Rose and Ruth visit their heroes from favourite books, including Alice and her friends in the chapter A Looking Glass Visit. There’s a nice picture of them all: see below or via the online link.